World 3 is the third world of Super Mario Run. Although its exact terrain is unknown, it contains four levels that consist of the desert, sky, grassland, and castle themes, respectively. This world is available after completion of World 2, and unlocks World 4 upon its own completion. 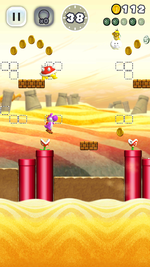 World 3-1 Big Spiny Blitz A desert level with many Big Spinies and a Lakitu. 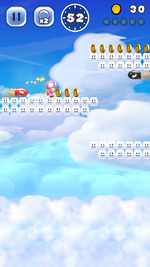 World 3-2 Bullet Bill Barrage A sky level with Bullet Bills and Bull's-Eye Bills. World 3-3 Shell Me the Way! 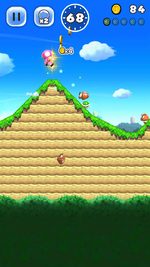 A grassland level with many Koopa Troopas and Brick Blocks. World 3-4 Fire Bar Castle! Youch! 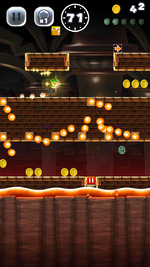 A castle level containing Fire Bars and Lava Bubbles, as well as the game's third boss battle, against Fake Bowser. This page was last edited on October 10, 2017, at 22:45.